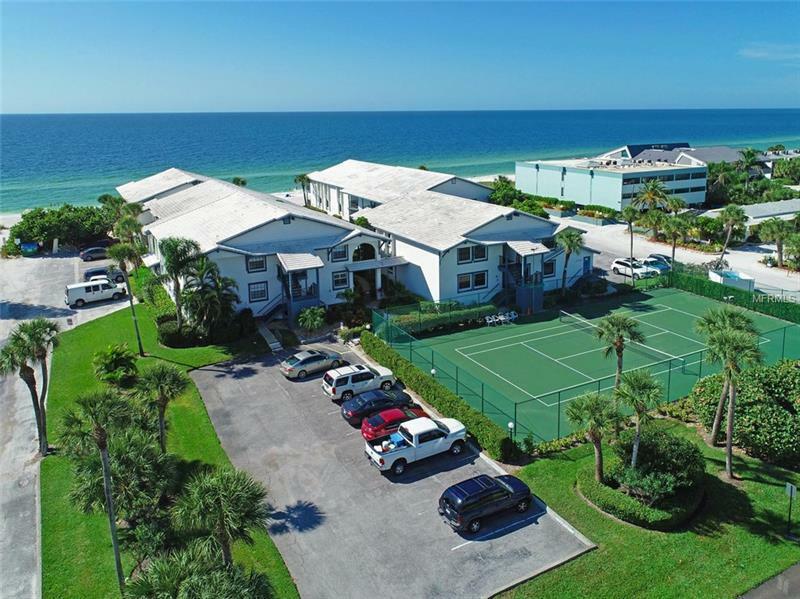 Relax to the sight and sound of the gently breaking waves from this second floor, 2 bedroom / 2 bathroom condo that looks over looks a heated pool to a sugar sand beach on the Gulf of Mexico. Beautiful hardwood floors in the living and dining areas lead out to a roomy screened balcony where you can enjoy the delightful breeze and the Gulf view while eating a delicious meal or reading a good book. Then catch a few rays on the outdoor deck before stepping off on to the beach where you can continue to relax or walk the beach to collect a few shells and get some exercise. The spacious eat-in kitchen features Saltillo tile flooring and lots of cabinet space. In addition, there is a laundry room with space for supplies. Gulfplace also offers tennis courts, an outdoor shower, assigned parking and glorious sunsets. Nearby there is a stop for the free island trolley that travels to the many shops, galleries and restaurants up and down the island. This peaceful retreat on the beach maybe just what you have been looking for. Call your realtor today for a private showing. Pet Restrictions: Pets allowed for owners only. Tenants are not allowed to have pets in Gulfplace.